Dining out was seen as a luxury in the past. However, Americans spend a significant amount of their income on restaurant services. We asked 1,200 people to list their spending habits when eating out. Americans spend a significant amount of their hard earned money on restaurant service – 3,365 per year per person, to be exact. This is up over $200 from the year before. In extreme cases, some families have racked up over $30,000 in a single year on eating out of the house, allowing smaller purchases to skyrocket out of control. So, what do our eating habits really look like? What are the most popular restaurants and grocery stores? Does income level have an effect on our preferences and choices? Does Money Make A Difference? Between 2015-2016, the amount of money that Americans spend dining out exceeded the amount they spend on groceries for the first time ever. Whether the allure comes from convenience of fast/casual dining or feeling luxurious at your favorite hot spot, going out to eat is becoming extremely popular. Today, Americans choose to spend their money at restaurants over grocery stores around half of the time, and that number increases with younger generations. All three income groups eat out at about the same frequency, averaging between three and four times per week and 14-16 times per month. This shows that income has no bearing on how often people leave the house to have a meal. In fact, the lower class eat out at a slightly higher rate than both the middle and upper class. Americans certainly fancy the convenience of eating out over cooking your own food, even though research shows that it is by far the more expensive option. When people do eat out, the average type of restaurant doesn't vary much by income level. 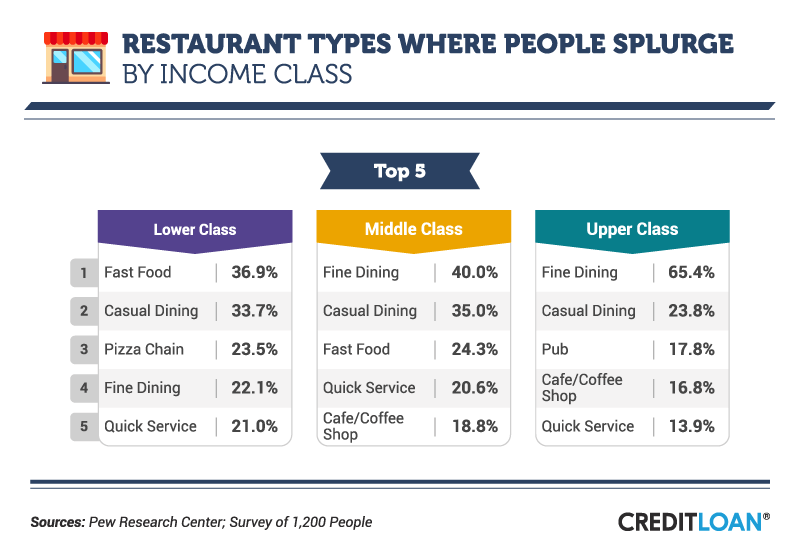 While some types of restaurants have a slight edge in different income groups, most of the popular trends are consistent. The lower class are the only group to visit buffet-style restaurants on a monthly basis. Through flexible menu options and strategic layout design, All-You-Can-Eat buffets have cracked the code to achieving wide-reaching appeal. Their labor costs are lower, and they don't have to raise prices often. Many see it as a way to fill up on a fixed amount of money, making it a viable option for lower income earners. Due to the sheer amount of food, they are seen as a cost-effective option to feeding a larger group of people or getting the absolute most bang-for-your-buck. With the right planning, it is possible to eat healthy, even if you are on a budget. "Splurging" means different things to different income earners. The upper and middle class consider fine dining as their extravagant treat. While the lower class views most styles of dining out as a splurge. Lower class earners spend their money on fast food the most at 37% of the time, while the number one place the upper class spend money on is fine dining at 65%. 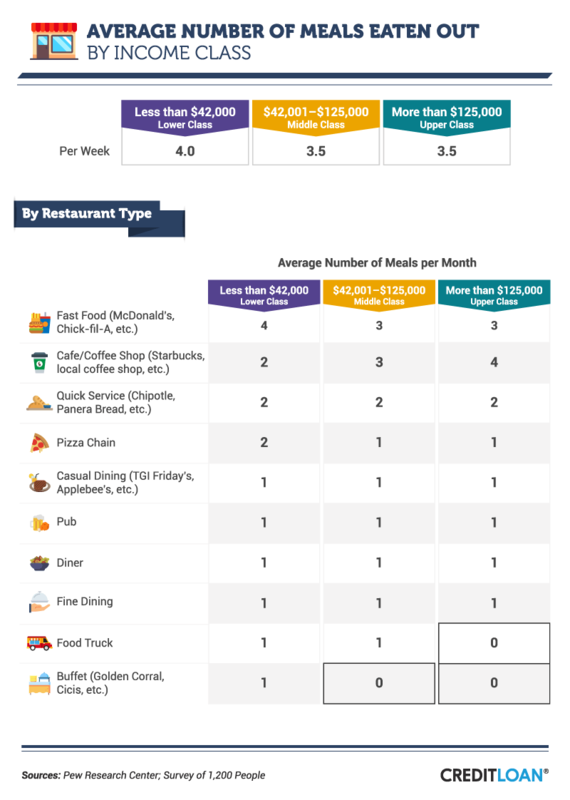 As income rises, fast food drops off the highest preferred restaurant styles and cafes and coffee shops become more popular. Prices at coffee shops have been steadily increasing, becoming too expensive for lower income earners as coffee shops disappear from their top 5 list. Fine dining is the real splurge, with average costs totaling $40-$50 per person and go up from there. The sky's the limit in fine dining, where individual check sizes can soar into the hundreds of dollars. Many are even finding ways to hack the fine dining industry with tips on how to save money when indulging. With more money comes more of a distinct choice of fast food. 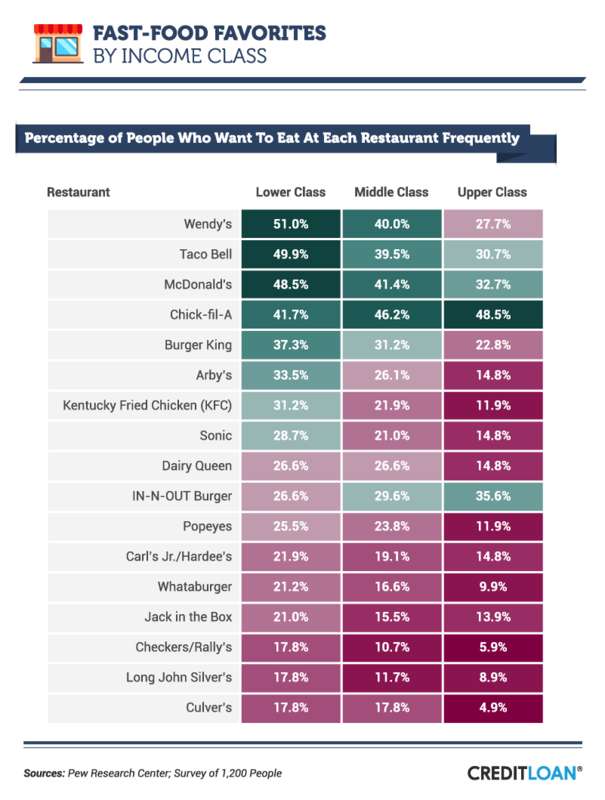 The top three results for the lower class (Wendy's, Taco Bell, McDonalds, in that order) are all within three percentage points of each other. Meanwhile, the distance between the choices becomes greater with the middle class and even larger for the upper class. When it comes to fast food, the middle and upper class have different habits. Those with higher incomes show a preference towards more regional fast food giants, such as In-n-Out and Chick-fil-A. With less than 2,000 locations, Chick-fil-A has managed to rank eighth among all quick service/fast casual restaurants, beating out pizza giants Dominos and Pizza Hut, as well as Sonic and even arguably their largest industry competitor, KFC. Many attribute Chick-fil-A's success to an unmatched level of customer service and cleanliness. Their rapid growth rate has garnered even the attention of McDonalds and their new classic chicken sandwich could be a replica of Chick-fil-A's iconic sandwich, pickles and all. 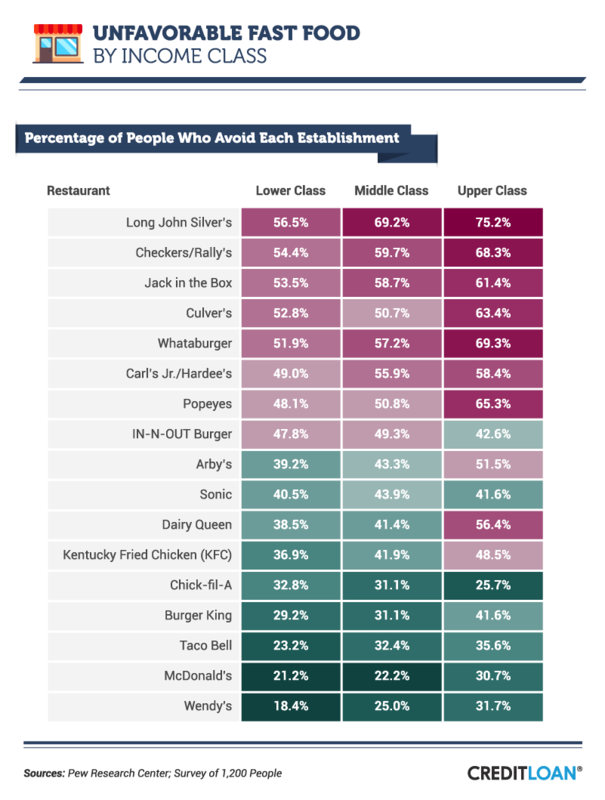 Overwhelmingly, Long John Silver's ranks number one least loved eating establishment, with over 75% of upper class and a majority of both lower and middle class respondents saying they never go there. This isn't their first time where being first wasn't best. They experienced a massive blow to their PR in 2013 when their limited time "Big Catch with Onion Rings" was rated the "worst restaurant meal in America" by the Center for Science in the Public Interest. They attempted to save face by committing to using a 100% soybean oil free of all trans fats, but they haven't been able to win back the public's heart. 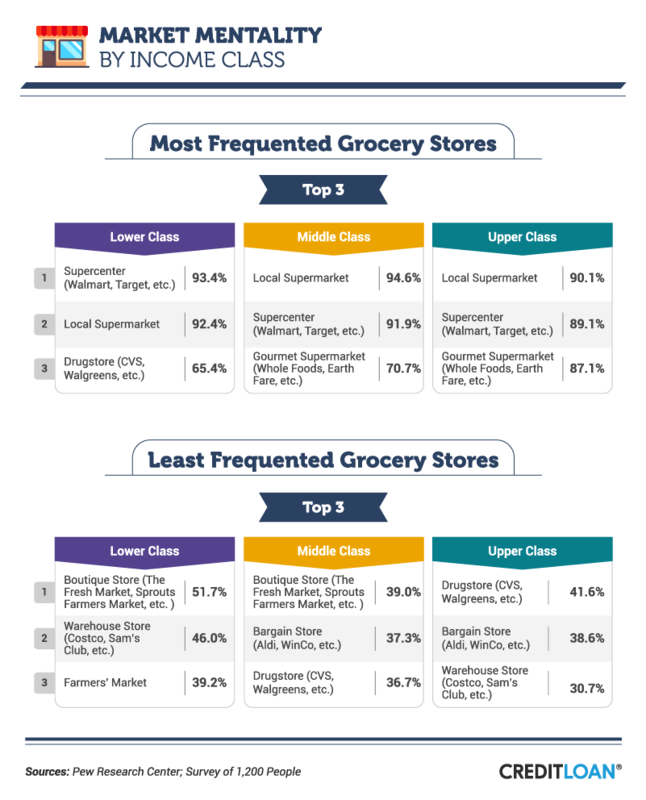 All income groups favor Supercenters and local supermarkets over all other types of grocery store. They are particularly popular due to their cost-saving value clubs, accessibility in all neighborhoods, and large variety of products for a society that values convenience. Their large frozen food sections have been booming, as frozen food sales are on the rise for the first time in a decade. Market leaders such as Congara Brand and Pinnacle Foods are exceeding financial expectations. Millennials, especially, are reaping the benefits of frozen meals, noting their cost-effectiveness and how easy it is to eliminate food waste when they are packaged for one. These Gourmet stores, such as Whole Foods and Earth Fare, have typically held a higher price point than the standard grocery store; however, the Whole Foods-Amazon merger has brought down prices considerably, making it more of an option to low income earners. A push for Whole Foods to have a presence in lower incomes neighborhoods in cities such as Detroit and Chicago has been successful amidst the presence of food deserts. Warehouse stores, such as Costco and Sam's Club, are not very popular among respondents. Membership fees – which have recently increased – are required to enter and shop, deterring many from shopping there. Drug stores account for 9% of retail food sales for the top 20 distributors, a significant number of the total grocery purchases around the country. While they are opening new locations at faster rates than grocery stores, the limited selection and lack of fresh ingredients outweighs the accessibility. Although 65% of lower class respondents say they buy groceries at the drugstore, over 36% of middle class and 41% of upper class never do. Sensible money saving practices can be incorporated into your everyday life. Spending less money out at restaurants and cooking your meals at home can save you money that can go towards a large purchase in the future. Planning out your meals can eliminate food waste which has cost Americans over one trillion dollars and counting. With research, you can find out how to save money every time you go to the grocery store and find tips on how to commit yourself to a food budget. Match up with a credit card best suited to your food budget needs. Find the best credit cards for cash back on grocery purchases today! We collected survey responses from 1,200 people from Amazon's Mechanical Turk. 54.1% of participants were female, and 45.9% were male. Participants ranged in age from 18 to 76, with a mean of 37.3 and a standard deviation of 12.1. We supplemented our survey with data from the Pew Research Center. This data allowed us to group our survey respondents into income classes. Spread the word about how unique our eating and grocery shopping habits are. However, be sure to credit us when you cite our work. Thanks in advance.